Frontiers Music Srl has announced the release of CIRCUS MAXIMUS' live album Havoc In Oslo, which will be released on August 4, 2017. It will be available on 2CD/DVD and 2CD/BluRay. 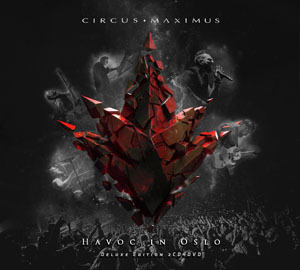 On February 6th, 2016, Norwegian prog metallers, CIRCUS MAXIMUS celebrated the release of their fourth studio album, Havoc with a sold out show at the Rockefeller in Oslo, with a stunning live production that involved pyro, sparks (literally), and a massive light rig. Ever since the band released Live In Japan via YouTube, they have been eager to make a proper live release in a physical format. Havoc In Oslo is a powerful statement from a band at the top of their game!